Co-Washing helps prolong your color. Extremely color safe, co-wash preserves color vibrancy longer than traditional cleansing (even with color-safe shampoo). Awesome second day hair on the first day, and every day. Most people love the way their hair looks and feels a day or two after washing. It is easier to style, less frizz, less fly-aways, smoother and softer. Co-Washing leaves hair like this from day one. Softer, healthier hair: Co-Washing removes impurities while allowing your scalp and hair’s natural oils to remain, resulting in softer, healthier hair. You will be shocked at how light and airy your hair feels after co-washing. Balanced scalp: Once you have converted to Co-Washing, your scalp adjust and oil production will balance out. This is beneficial for both oily and dry scalp/hair types. A balanced scalp will not over-produce or under-produce natural oils. So oilier heads will become less so, and dryer heads will get the moisture it needs. Barberia Salon Co-Wash uses natural extracts from thyme and witch hazel to purify and sunflower seed extracts to moisturize. It is gluten, salt and sulfate free & not tested on animals. Co-Wash contains trace detergents called cationic surfactants, or “quats” for short (behentrimonium chloride.) When mixed with water, the quats pick up tiny amounts of dirt, leaving co-washed hair feeling clean – but not squeaky clean. At the same time, the conditioner hydrates and moisturizes while protecting hair. Co-Wash lets your natural oils stay put under your scalp’s surface, where they belong… but removes surface dirt, products and oil. The result allows your natural oils to do their thing which is to moisturize, protect, strengthen and balance your hair and scalp. All hair types with healthy scalps including color-processed hair. Co-washing has been used for ages on curly, wavy and medium to thick hair, and these types will see amazing results in softness and manageability. But fine hair/ straight hair can also see benefits, and may need a more gradual transition and to continue to be alternated with a deep cleansing shampoo every 2 weeks. Excessively oily scalps, or those with dermatitis or bad dandruff should steer clear and stick to their medicated regime as Co-wash does not treat scalp problems. Fully saturate your hair and scalp with water until soaking wet. Apply a generous amount of co-wash into palm of hand, up to a golf ball size amount for extra thick/long hair. This may seem like a lot, but don’t forget that you’re cleansing, not just conditioning. Massage Co-Wash into the scalp and work your way down the hair shaft to the ends. Apply more if needed. Allow Co-Wash to be absorbed for three to five minutes; longer if hair is especially dry or damaged. Detangle hair. Rinse out well, again working through the hair from root to tip. CURLY, THICK, WAVY OR COARSE HAIR: Co-wash works wonders on curly, wavy thick and/ or coarse hair since it naturally lacks moisture. Co-Wash your hair every 3-5 days, as needed. FINE, STRAIGHT, LIGHTLY WAVY, OR LIMP HAIR: Try alternating first, then transition to just co-washing every other day or, if you can, every 3 days (many straight and curly haired heads that are fine but have a lot of hair can get away with Co-Washing every third day). For oilier scalps and during the summer, use a deep cleansing shampoo every 2 weeks or so. Want to try C0-Washing? We use it at the shampoo bowl! Ask your stylist to prep your hair before your next appointment. Olaplex is a product that is added to color to prevent hair damage. Hair bonds are broken during thermal, mechanical and chemical services. Olaplex reconnects broken disulfide sulfur bonds in the hair. Olaplex is going to make your hair stronger, healthier, and your color will last longer. If you want to lighten your hair, normally you would risk damage. But Olaplex prevents this damage. It heals, seals, and multiplies the bonds in the hair. Will Olaplex work on my hair? Olaplex has been tested on virtually every hair type and it works: Asian, Caucasian, African American, previously chemically processed and virgin (never before colored) all respond to Olaplex. Everyone wants to know if Olaplex builds up in your hair making it difficult to color or lighten after several uses. The quick answer is that the hair just keeps getting better. Tested by top celebrity colorists who have everything to lose, Olaplex has been tried on thousands of clients, multiple times for over a year. Not one single report of anything negative. And Tracey isn’t the only one. 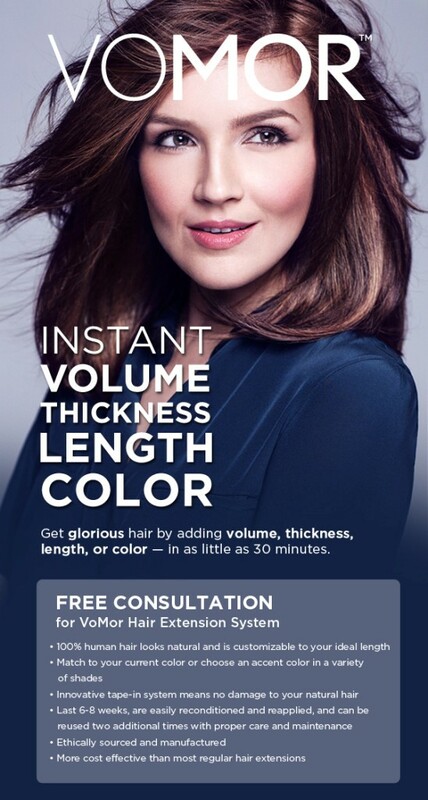 In fact, nearly every major celebrity salon in Beverly Hills and West Hollywood, including Guy Tang, Nine Zero One, Estilo, Goodform, Sally Hershberger and Chris McMillan all have their army of celebrity colorists testing this “secret” formula, which from all accounts, is no longer a secret anymore. Dr. Craig Hawker, a world famous chemist from the polymer field of chemistry, with countless awards and patents to his name, who has nothing to do with hair, has created a new molecule that can link broken bonds in hair back together again. This molecule, he claims, when added into any hair color services, will absolutely prevent any breakage. It all boils down to one simple idea—a hair colorist would never have to worry about destroying a client’s hair ever again. One simple molecule. One simple ingredient. Nothing simple about its effects. Imagine no breakage ever again. Imagine never stripping hair color again. The top strand was colored with Olaplex added. 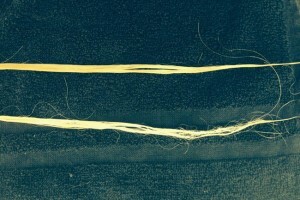 The bottom strand was not. You will get a bottle of the No. 3 Take Home Hair Perfector, which is part of the professional service. Use it once a week. It will make a huge difference in the health of your hair. I was about to make a colossal error and didn’t have a clue. So naïve. I had entered a good, upbeat phase in my life. All of my children had just entered school and I was at last getting some time to explore my own interests. I was feeling happier and wanted to reflect that to the world. I was ready for a change and I intuitively knew that red hair was just what I needed. I wanted bright, red hair. Make no mistake, if I wasn’t going to be reflecting light, I wasn’t happy. The only problem is I had dyed my hair dark previously in a haphazard way to cure some wayward grays. And, to complicate matters my gray roots were already starting to show. Full of enthusiasm, I ran off to my local drugstore to buy the best red hair dye they had to offer. I hurried home, applied the dye and waited for my outward transformation. I nearly trembled with anticipation. When I looked in the mirror, I did tremble. From my scalp to approximately three inches down my hair, I was red. From there on, I was still a dark brunette. This was not okay. This was not what I wanted. I’d like to say I handled the situation with grace, but the truth is I flipped out. I stood in that bathroom for a long, long time, combing my hair all sorts of ways just to make it seem okay. I finally reached my uninformed conclusion-It was time to go renegade. Obviously, I just needed more red. Clearly, that would solve the problem and make the darker hair comply! Luckily, I had one more box stashed under my sink. I went with it. Results were even worse. Brighter red on top and barely any red tinge further down my hair. Realizing that I was out-witted by my own hair, I asked for help from my village (Facebook friends). I was directed to Terry DeMarco’s Barberia. I felt I was beyond hope but was assured it would be okay. From the moment I initiated contact, I received nothing but the best. Everyone I encountered was warm, friendly and approachable. I chilled out. The thing is, I could bore you with all the details of how we came to this color but what I most want you to take away from this message is this: They gave me the time, space and encouragement to find the right shade of red for me. It’s worth mentioning that this couldn’t have been done if I wasn’t first comfortable, not just physically but mentally. Some salons just rush you in and out. Terry DeMarco’s Barberia treated it as a creative process that should not be rushed. After all, if it is worth doing, it is worth doing right. While I know my hair color isn’t traditional or for everybody, what is universal is that we all want to look good and feel good about ourselves. I am grateful to Terry DeMarco’s Barberia, Courtney and Tess for helping me look the way I truly wanted. It feels amazing. 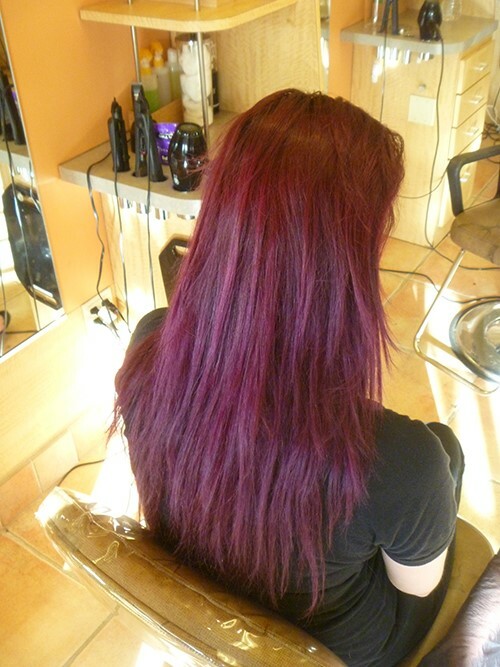 Jen came in with “hot” roots – they were bright pink. 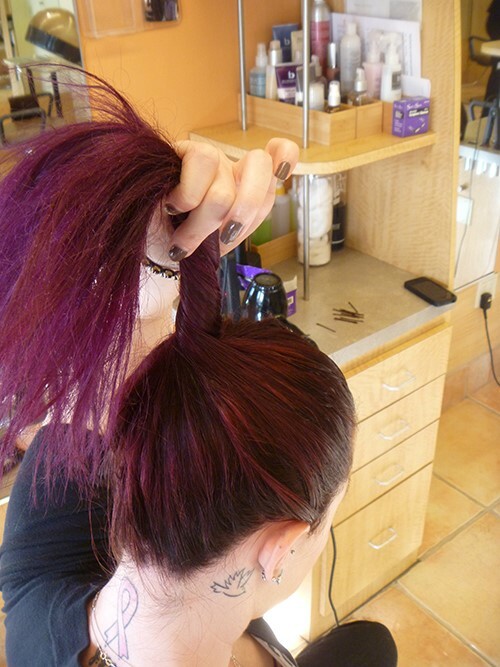 Her ends had absorbed excess pigment; this is common with home color applications. 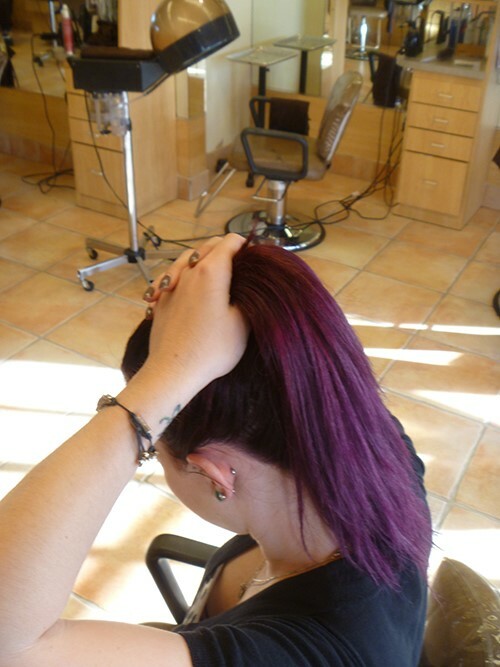 Courtney performed a color wash to remove the excess pigment and bring even color throughout the hair. Then she applied a highly pigmented deep red two times. 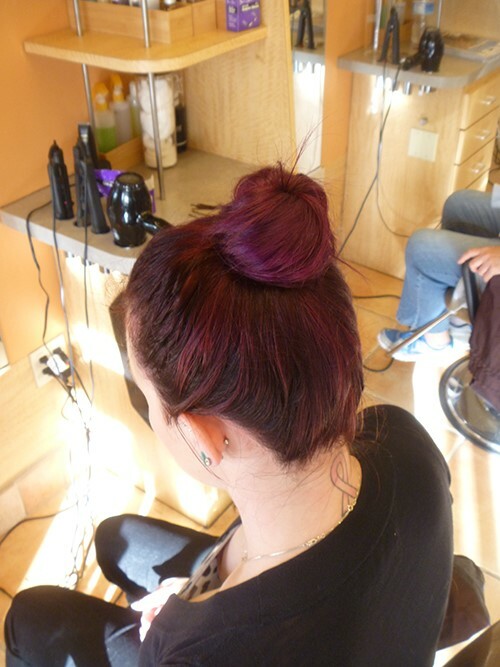 The result: even, all over color in a vibrant, deep red – definitely reflective of Jen’s vivacious new phase! Why don’t you give us the history of your hair over the last few years? Megan: A little over two years ago, I went platinum blonde. I liked it for a little bit, but then decided it was time for a change and went bright red. Wow! That was a big change. How did that work out? Megan: Yeah, I like being adventurous with my hair. The bright red looked really cool but it was hard to maintain because it faded quickly and I needed to get it touched up often, which I didn’t really have time to do. It was fun while it lasted. So you just decided to let it grow out? Megan: Pretty much. I didn’t really know what else I could do because I didn’t want to go platinum again and I thought if I just let it grow out to my natural color I could cut off the color as it grew out. So what brought you Barberia? Megan: I heard from my sister that you were doing these color correction case studies. My hair had been growing out for almost two years and was like 4 different colors, and I wanted to be blonde again, but a more natural, blended color. Now your look is a more natural honey blonde with some darker lowlights… what do you think? Megan: This is the happiest I have ever been with my hair! I love it! Great! We are glad to hear. Megan came in with three distinct sections of color: at the top, the outgrowth of her natural brown, in the middle layers of red over platinum blonde that had different degrees of fadage which included shades of hot pink, light pink and orange. At the ends, there were some blonde sections mixed in with the faded orange. This color was making her skin tone appear sallow and not highlighting her best features. Mimi performed two color washes and then a full head highlight with lowlights. This process took approximately 5 hours! To restore & repair her hair, Megan had a Dream Repair intensive conditioning treatment, followed by a cut and flat iron to get her final look. The result is a natural blonde with shades of honey & butter with caramel lowlights for dimension. Her complexion is warmer, brighter and her beautiful green eyes pop! As summer comes to an end, it is time look back on the past months of fun-in-the-sun, long days & warm nights; living it up and making memories to last a lifetime. The cooler months ahead signal a time for a change as nature begins her transformation — changing leaves, cooler air and longer nights — it is time to think about transforming your look as well. But end-of-summer care is more than just changing your hairstyle. It is also about undoing the damage brought on by summer’s heat, humidity, and fun-in-the-sun activities. No matter how well you tended to your tresses this summer, some special treatment is in order to bring it back into optimum condition. End of summer hair care is about erasing damage and protecting your hair during the cooler months ahead. With this in mind, Barberia has designed a professional, intensive in-salon treatment to address the inevitable build-up and damage from summer that yields immediate results! END OF SUMMER SPECIAL : $50.00 — SAVE $18.00!! If your idea of blonde is nondescript, one-dimensional platinum, you’ve got another thing coming! Celebrity blonde trends equal new ways to liven up your look with summer ready updates. Here, expert hair colorist Terry DeMarco shares tips for making the most of your blonde tresses this summer. Terry says blondes will fit into one of three categories this season—Blushing Blonde, Vanilla Vamp and Caramel Delight. How to get it: Your Barberia colorist will create a base color and then use the Balayage technique to apply a caramel tone and process, then add more balayage for a subtle strawberry shade. Is it for you? This delicate and cool tone works well for blondes who want to take brightening up to the next step. This look requires regular maintenance to keep locks uniform from root to end. How to get it: If you are already blonde, your Barberia colorist will create a base and then place in two different types of highlights to keep the color dimensional and radiant. The look is completed with a toner to get that perfect vanilla hue. Upkeep will require monthly toners and highlights every 6 weeks. Is it for you? Dimensional and refined, this is a great option for transitioning from brunette to blonde. How to get it: Your Barberia colorist will start by “breaking your base” to lighten your hair overall, then highlight and tone to caramel. Protect your blonde investment! “Regular upkeep requires consistent salon touch ups” Says Terry. At home TLC is essential as well: “summer blondes require extra gentle cleansing and deep conditioning,” he advises. Blondes will preserve hair health and extend color by using a shampoo and conditioner specifically formulated for blonde hair, like Barberia’s True Hue Anti-Fading Shampoo. “Another must is a deep conditioner at least once a week,” Terry says. One to try: Barberia’s Indulge Masque, with super moisturizing of avocado and noniberry.” For a chic way to protect delicate blonde color, try a hat or scarf when sunbathing! Although the world did not end in 2012, that high-contrast ombré could have been wiped off the map. Extreme ombré has had its day in the sun, and a more understated version will take center stage this year, “I see [extreme ombré] phasing out, the look has been overkill. The style will go back to a prettier “sun-flicked” accents [á la Kristen Wiig].” Ombré doesn’t have to stick to its traditional brown to blonde graduation in 2013. Blondes, redheads and brunettes can add dimension with this technique and lightening treated strands 2-3 shades above their current color. The Verdict: Ombré lives on! This year we’ll see a much more delicate take on the trend.